If you drive, ride or fly over Japan, you might note that a very large part of the country is covered with trees. If you’re traveling in autumn or early winter, you might also note that much of the forested land is in uniform patches and swaths of dense, dark green, or perhaps a faint pale-yellowish-brown. The dark green will most probably be Japanese cypress (hinoki) or Japanese cedar (sugi). The pale-yellowish-brown plantations are probably Japanese larch (karamatsu), a conifer that changes color and sheds its needles before winter. Whether it’s the dark-green or yellowish-brown trees that catch your eye, most will have been planted since the end of World War II in 1945, when the national policy was to replace mixed-growth forest with conifers. Conifers of the same stock and age, and all planted at the same time, are supposed to grow straight and symmetrically tall, making them easy to harvest and mill into straight, uniform timber. However, a problem that was overlooked was that trees planted close together will reach for the light together until their lower branches are shaded out and only the tops are green. When this happens, the trees cease to get the sunlight they need to grow, branches are touching and chafing, and — in the worst cases — the land beneath the trees turns brown, with hardly any green growth at all. This land loses life and its capacity to retain water because it is no longer composed of spongy humus. Heavy rains on steep slopes of this kind lead to erosion and landslides. Like cabbages or radishes, plantations of trees need to be trimmed. In most of Japan this has not been done. During the heady roughly quarter-century of the so-called economic bubble, which started around the time of the 1964 Tokyo Olympics, Japanese corporations, with a great new freedom to wheel and deal all over the globe, began to buy cheap foreign timber and have it milled abroad for far easier transportation and sale. Today, the situation is slightly improving, but until a few years ago 80 percent of the wood products used in Japan were imported. With 67 percent of Japan’s land area being covered in trees, this was, and still is, a travesty. In those heady days from the mid-1960s, with the strength of the yen on the rise, economic strains on the nation’s timber growing, harvesting and distributing system — which had been a mainstay of Japan’s economy and culture for centuries — kept on increasing. If the nation had invested in forestry technology after the war, as it did in many other fields, the industry could not only have survived, but really thrived — as it did in Germany! Japanese timber is basically of excellent quality and, properly managed, it is a sustainable resource. Unfortunately, though, young ladies looking for a marriage partner began to prefer chaps who went to work in a white shirt and a tie over those wearing hardhats and safety boots. 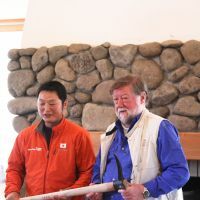 I have been nurturing woodland here in Nagano Prefecture where I live since 1986, and last year I was officially designated the prefecture’s Forest Ambassador. In forest area by prefecture, Hokkaido ranks first in Japan, Akita is second and Nagano third. Despite this, when we started to build our C.W. Nicol Afan Woodland Trust Centre three years ago, we were unable to gather enough timber from Nagano and had to reach out all over Japan. I absolutely insisted on using only Japanese lumber. Was it that expensive? No — but we just had to go all over the country to get it. The trees were there but the lumber wasn’t. Last year was the United Nations’ International Year of Forests, and I was one of the Japanese national committee members. We hosted one of the main Year of Forests meetings here in Nagano, in our new and beautiful Trust Centre. Most of the committee members arrived by bus, and were deposited at the original front entrance of the trust’s woodlands. To reach the Trust Centre, they then had to go through our woods — where there are 80 species of trees and rich fauna and flora — strolling along gentle wood-chip pathways made from branches and spindly trees we’d pruned out to make way for stronger growth. After the meeting, tea and cold drinks were served in the woods, as well as local tomatoes and cucumbers cooled in ice and served with a simple miso dip. We’d also organized various guided tours, and on one of them we showed the head of the government’s Forestry Agency the borders of our trust’s healthy and vibrant woodland up against the dark, dense, monoculture plantations of the adjoining national forest. When the forestry chief saw that he nodded his head: “We’ll have to do something about this,” he said. 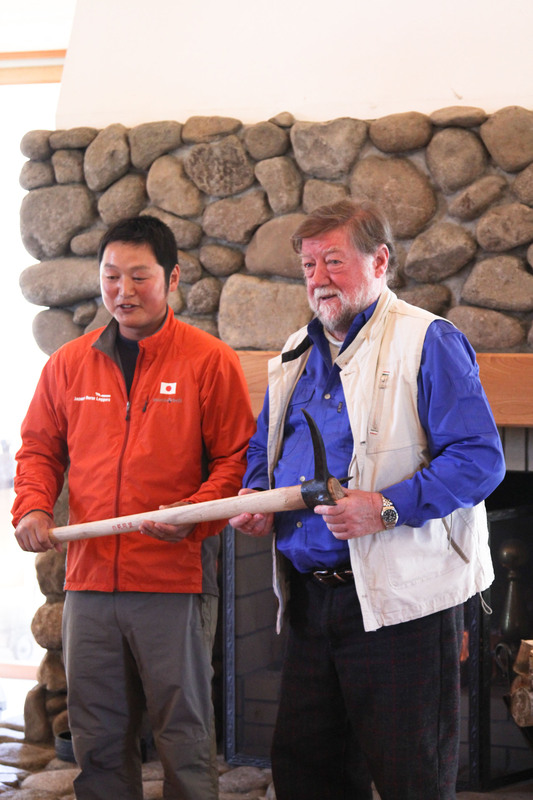 Since then, we have continued with our meetings involving renowned forestry experts, officials from the Forestry Agency, both central and prefectural, officials from the Nagano prefectural government, our Town Office and the local forestry cooperative. As a result, we formulated an agreement whereby our Afan Woodland Trust, in consultation with the other bodies, would take over management of 27 hectares of the national forest bordering our woodland. This is a historic incentive. Our objectives are to improve the quality of the trees now growing in that large area of woodland; to improve its biodiversity; and to study and enhance the use of the forest for sustainable eco-tourism and healing. As you might expect, the wording of the agreement is detailed and bureaucratic, but that’s the essence of it. We were all agreed from the start that the crowded conifers needed to be trimmed to let in light that would enable younger branches to grow from the spindly trunks, and also allow light to reach the forest floor and turn it green. This will give the remaining trees a tremendous boost. We were also in agreement that sections of this 27 hectares should be gradually turned into a mixed woodland of conifers and deciduous trees, preferably of local origin. In our experience, this even further enhances the growth of the remaining conifers because the younger deciduous trees give cool and shade to the dark trunks of the cedars and larches. Their fallen leaves also improve the water-retention and fertility of the soil. In our woods, where my forester and I trimmed out two dense patches of larches and cedars 18 years ago, growing deciduous trees between, the trunks of the cedars and larches have gone from being as far around as a man’s neck to the diameter of a 205-liter drum. I insisted that the logs from the first trimming should be extracted by horses, not by machinery. 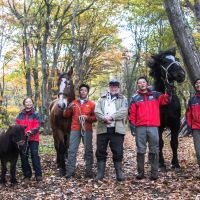 To do this we brought in two large Percheron geldings, Daichan and Samurai King, from Tono in Iwate Prefecture, together with their handler-owners, Iwama Takashi and Ken and Yukiko Hachimaru. We invited interested and concerned people for an informal series of lectures and a lunch at our Trust Centre, then moved into the woods for a demonstration of what these magnificent horses and their expert handlers could do. 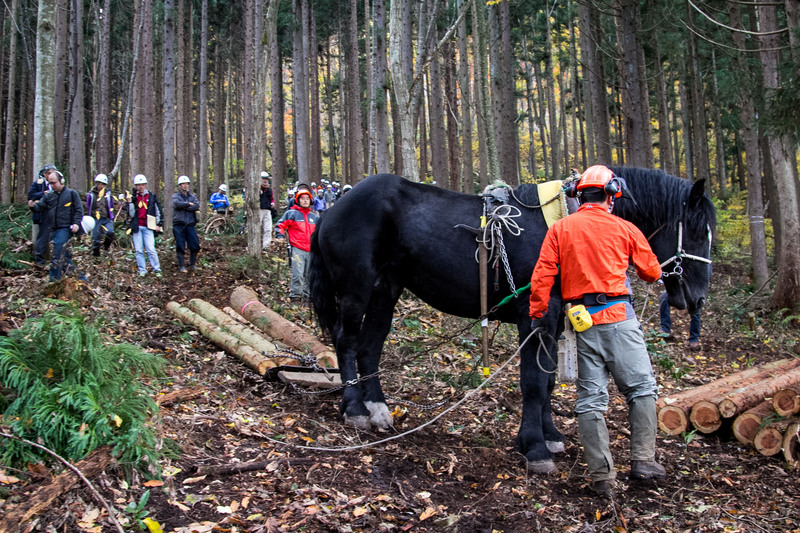 Using horses to extract timber was the common way of doing things in Nagano until about 40 years ago. Now, in our area, there are no working horses. The horses used in those days were smaller, and sleds were used when the snow came. 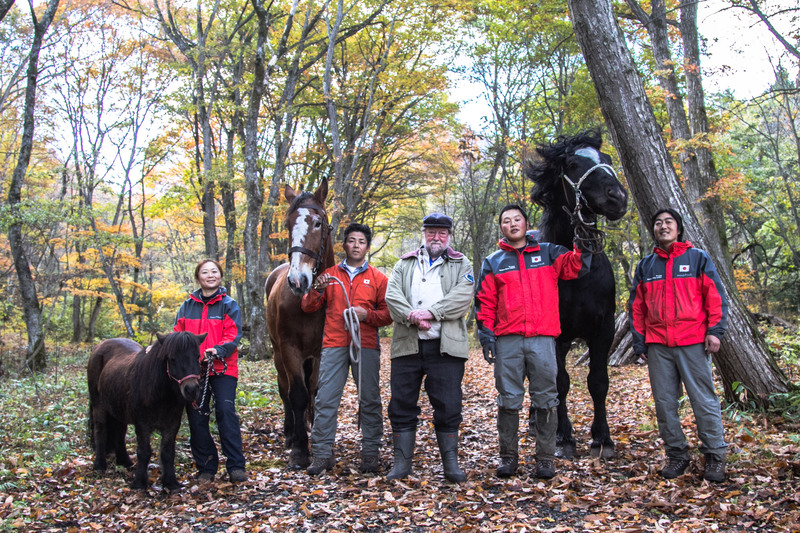 I believe that modern horse-logging, especially with the latest equipment being developed and tested in Europe and North America (where the use of working horses is becoming increasingly popular), is one very important way for Japan to go. 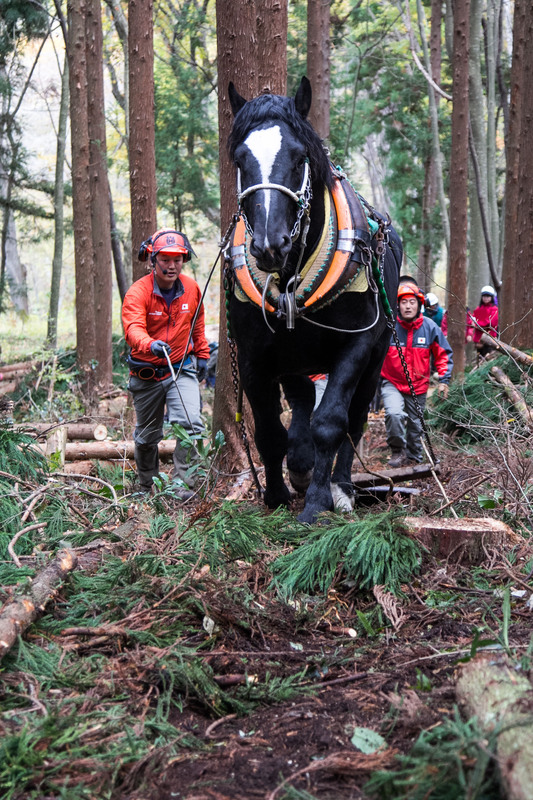 Horses do less damage to the forest, are quietly efficient, and do so much to improve the beauty and enhance the joy of working in the woods. 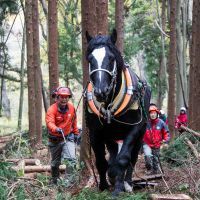 Horse-logging is especially suited for small, diverse woodlands, on difficult slopes, where trimming rather than clearing is needed, and where the sensitivity of the ecology must be protected. Horses are also a wonderful part of rural scenery, and people just love to see them! With proper care and training, natural horse power is sustainable, moreover, with locally-grown fuel. I could enthuse for pages, but as others have written about this so well, I urge those interested to spend a few minutes of study on the Internet. 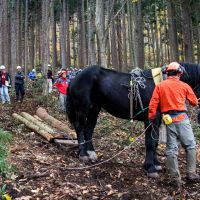 I noticed that in bringing in the horses to extract the logs from this section of forest that had not been tended to for 30 years, they and their handlers worked the natural lay of the land. As a few dozen logs were taken out, a path was made. Now, once the logs from this trimming have all been taken out, we will survey the new horse-made paths and decide which to convert to footpaths. We will cover those paths with a layer of wood chips, made in-situ from poor-quality logs and branches. This will make it easier to walk and study in the woods, as we will monitor what happens from now until the next trimming. As for the logs, our Afan Trust will buy them; after all, they belong to the nation. We will probably use them to make or replace small bridges in our woodlands; to start building a workshop-warehouse; and, we hope, a stable complex. We will, of course, do all it takes locally.